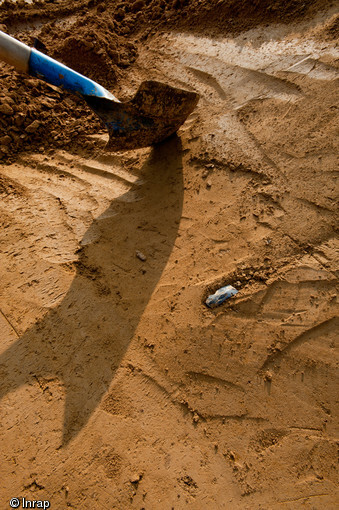 The Subversive Archaeologist: Can You Say "Extreme Survey"? Upper Palaeolithic Blade Tool (Denis Gliksman photo, INRAP). 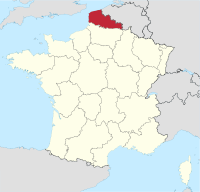 Here, in Havrincourt (Les Bosquets, HAVRINCOURT, Pas-de-Calais, Nord-Pas-de-Calais, France), heavy machinery is exposing more than 7 m-deep löess deposits in vast, stepped, trenches, illuminating life in the millennia before the last glacial maximum. Löess is extremely fine, wind-blown dust that blankets many parts of Europe, Asia and North America in deep, mostly unstratified deposits. 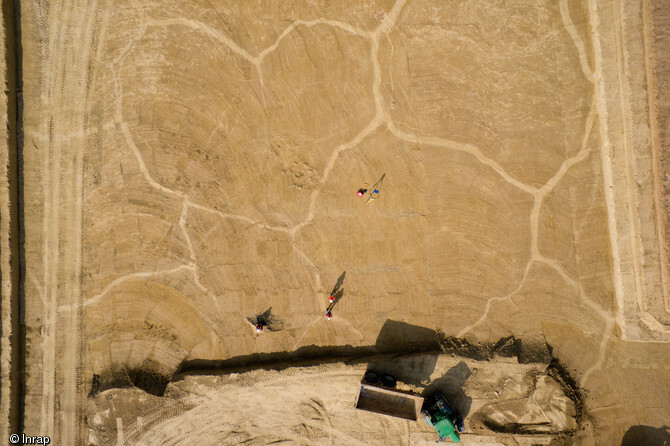 Even if this kind of sedimentation were not indicative of the climate during which it was laid down, evidence of large-scale permafrost features (visible in the photo below) would tell us the same story. These excavations of the Mammoth steppes of northern Europe are truly phenomenal in their scale. Permafrost Features visible from the air: frost wedges that delineate frost polygons (photo by Denis Gliksman, INRAP). 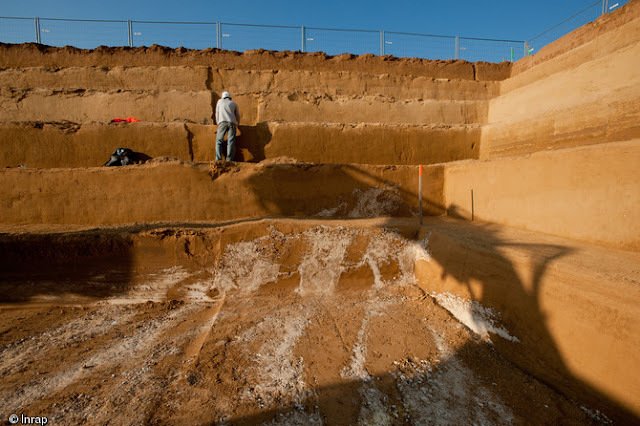 Years ago, Leroi-Gourhan excavated at Pincevent, an open-air site in the Paris Basin, where overbank deposits had gently buried an immense Upper Palaeolithic camp site about 13 kyr ago. Not to denigrate the fabulous discoveries at Pincevent, but these present-day exposures in northern France beggar that evidence in the sheer enormity of the artifact scatters, and for the time-depth involved—30 to 50 kyr. Mammoth tooth (Denis Gliksman photo, INRAP). To watch a video recounting these excavations is to get an impression of what most cultural resources managers, and indeed, most palaeoanthropologists can only dream of—the ability not only to study the archaeological landscape in two dimensions in the present, but to have the ability to follow it back in time as well. 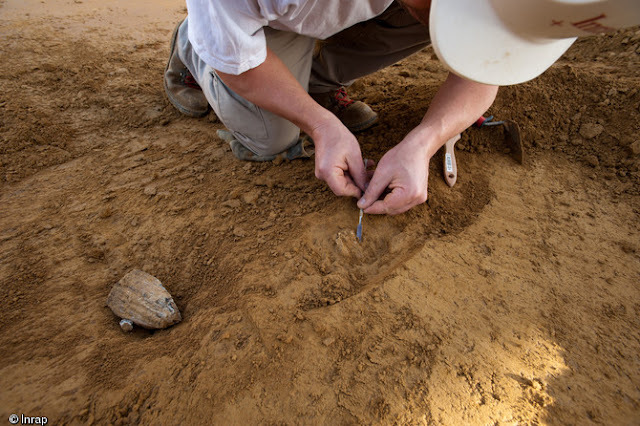 While you're watching the video, note the technical expertise of the shovel operator—deftly scraping away centimeters at a time to enable archaeologists easily to spot the artifacts. 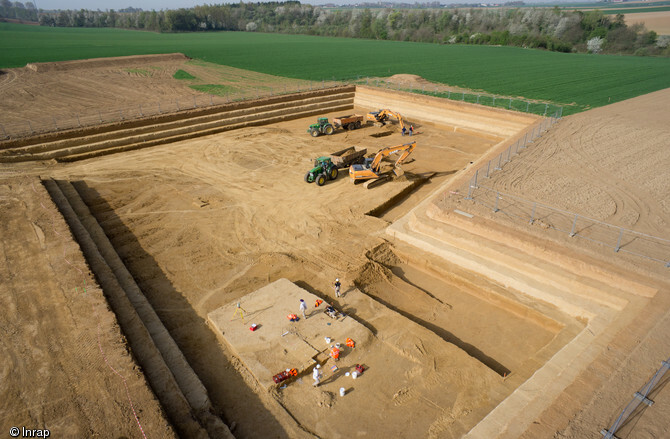 Mammoth Steppe of Northern Europe: Stepped Excavation at Havrincourt (Denis Gliksman photo, INRAP). I'd keep an eye on these investigations. We're sure to learn a great deal about Neanderthal behaviour and how it compares to that of modern humans under more or less the same environmental conditions. For more information visit the INRAP web page for the project: Les steppes paléolithiques d'Havrincourt.